Making great design transparent and inspiring. Greer’s interpretation will surely give you a giggle: “Whether or not, you have much money to spend, but especially if you haven’t, you need one marvelous decorative object which you love outrageously, which you may have spent far more for than you could afford, and perhaps which no one else in his right mind would ever have spent as much for as you did.” Come on, now! How many of us stretched ourselves and budget for the perfect pair of high heeled shoes for that high school/college reunion, or just for the love of shoes? Many designers consider the piece de resistance as the “jumping off point”. It is a strategy to keep the noise in your head at bay. It acts as an inspiration, and is different for everyone. The trick is to start with that favorite piece, color or anything else that may illicit an extra heart beat…..and then you build from there. So, if you’ve got that ONE thing that is special to you of which you simply can not resist, listen to your heart, and go for it! Greer’s piece de resistance examples include art work, a bust, an inkwell, a vase, or a first “folio of Shakespeare” (say what?!). Since we’re in the 21st century, why not think outside the box and take it a step further: If you are lucky enough to own a home overlooking a splendid golf course, gorgeous lake or ocean, or well preserved ravine, or simply wish to extend the outside in, why couldn’t your piece de resistance be a folding door system or gallery of windows allowing a seamless integration with the outside world? And, why we’re at it, why couldn’t that marvelous piece de resistance be an entire space vs. object, like say, a kitchen? Or, if your kitchen budget range isn’t $50K-100K+, you still got choices. If you’re anything like me- an avid wine enthusiast, a built-in wine refrigeration system would be a dream come true! Don’t get me wrong, your piece de resistance piece could also be inherited or even a bargain basement find. There are so many choices available today which are treasure troves for design geeks like ourselves. For example, there are auction houses and online stores where you can buy and sell vintage furniture and decor that are trust worthy and offer full-services. de Gournay’s chinoiserie St. Laurent hand-painted wall covering on tea paper. What’s your Piece de Resistance? Gotta go! Off to San Francisco’s Design Center to find that outrageously stunning piece de resistance for my client…….Til next time. Should Interior Design Be Taken So Seriously? The following series of interior design blogs will be inspired by the book, inside design, by Michael Greer (now deceased). I’ve had this idea floating in my creative humming head of mine for over 2+ years. This book was given to me nearly six years ago during an interior design internship by an Artist/Designer who went to school with Greer at Parsons School of Design in NY. His book is executed with a great deal of knowledge and a little sarcasm, humor and wit thrown in for good measure. Think of Julie & Julia where Julie decides to create every recipe from Julia Child’s cookbook and records her experiences. Each of my posts will reflect a chapter in Greer’s book. My goal is to impart design knowledge, personal experience and some fun (thrown in for good measure)! My design philosophy is this: Good design should inspire, and it should not be taken so seriously all of the time. The two of us would get along like chums! Most people probably haven’t heard of Michael Greer. He was a prominent “decorator” in the 60’s in Manhattan. (Shhh! Don’t tell anyone you heard me say that. Back “in the day” that’s what they were called.) A Georgian born society decorator who reached the pinnacle of his success in New York’s affluent and elitist circles in the 60’s. His client base grew steadily and spanned coast to coast. 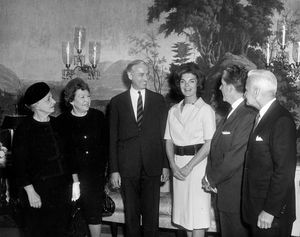 Even the late Jacqueline Kennedy, Eleanor Roosevelt and Lady Bird Johnson consulted with him on White House projects. Greer had a love for antiques and collecting, and penchant for neoclassicism (French Eighteenth Century). Unfortunately, his life was cut tragically short in 1976, and was found murdered in his Manhattan home. To this day, his death is shrouded with controversy and mystery. Stay tuned for the first chapter, piece de resistance. (Yes, I am aware that I did not use capital letters. In his book, Greer uses all lower case. Note the book cover itself). As my friends and clients often hear me say repeatedly: “Design is in the details.”. You also have to possess a solid grasp of the rules before they can be broken– and have fun! Author JAS Interior DesignsPosted on May 22, 2016 June 8, 2016 Categories Antiques, Decorator, Interior Design, Michael Greer, Neoclassicism, UncategorizedTags Antiques, China, Decorator, Delft, Focal Point, Inspiring Design, Interior Design, NeoclassicismLeave a comment on Should Interior Design Be Taken So Seriously? How Not to Electrocute Your Clients While Keeping It Interesting, Decoratively Speaking. Essential Architectural Moldings: Is it Breaking The Mold? Architectural Moldings: Are Your Clients Ethically Disposed to Making Budget Available? What does the Queen Anne Style and Pansy Yokum Have in Common? jAs Interior Designs Create a free website or blog at WordPress.com.